Just as the Yankees introduced their new center fielder, Curtis Granderson, today, they were apparently in full force as we approach the 2010 regular season. The NY Post reported today that the Yankees are close to a one-year deal with the left hand hitting, Nick Johnson. He is a former Yankee, should the Yankees bring him back? He would fill in perfectly as a DH with Matsui gone and Damon questionable. He has a .402 career OBP. He is only 31 years old. He made $5.5 million last year, so the Yankees could get him for a cheap, one-year deal. He started his career with the Yankees, so he will fit in nicely. He is extremely injury prone, missing all of the 2007 season. He is slow and might not be a good number two hitter should he need to replace Damon. Chat. Nick Johnson was a great Yankee when he was around, and I was surprised when they let him go. Bottom line is that this guy is a good, solid hitter who can get on base, and that’s exactly what you need. In the end, a 1-year $5 million investment in the 31 year old Johnson is a lot safer than a 3-year $39 million investment in the 36 year old Damon. 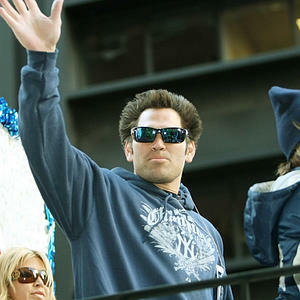 The NY Post is reporting that Johnny Damon is ready to look for other offers as the Yankees continue to stall. Damon has made it clear that he wants to return to the Bronx, and the Yankees have made it clear that they too want him back. The negotiations have come to a stalemate. Damon’s agent, Scott Boras, thinks Damon deserves a three to four year deal worth at least $13 million a year. The Yankees, on the other hand, feel a two-year, $20 million deal is more appropriate. So what should the Yankees do? As I said yesterday, pitching is the #1 priority for the Yankees right now, or at least it better be. If Cashman feels that a three or four year deal is really inappropriate, then I’m going to trust him. The Yankees have no reason to make lucrative or risky deals on players they don’t really need right now. If one thing is going to make this team better, it’s going to be pitching. Wow. Who would have thought that the first big deal of the off season would involve the defending champions? According to the NY Post, the Yankees have a agreed upon a three way trade that would send Granderson to the Yankees, Ian Kennedy to the Diamondbacks and Phil Coke and Austin Jackson to the Tigers. He is only 29 years old. He has stolen over 65 bases in all of his past four seasons. He hit 30 home runs last season, and with the right field at Yankee Stadium combined with his lefty bat, that is sure to rise. The Yankees, in essence, made a good deal, only giving up one top prospect. He can play a good center field. The Yankees have given up their top prospect. Without Coke and Bruney, this bullpen is extremely thin now. Granderson hits .183 against left-handed pitching. He strikes out a lot, leading the league in that category in 2006. You tell me. I’m torn on this one. Granderson is a great player who is young and can make a difference at Yankee Stadium. It was a good thing that the Yankees didn’t give up too much. They still have huge prospects waiting to come up, so theres still some hope in that regard. Coke and Kennedy I can live without, but with Bruney gone as well, the Yankees better have a plan for this suddenly thin bullpen. To me, what this really means is that the Yankees have kind of pulled themselves out of the race for Halladay. In the end, as much as I was looking forward to watching Jackson come up and grow, the thought of a second trophy next year is uncomparable. Thats what you have to play for. He is only 29 years old and will be 30 by the beginning of next season. He has had an ERA below three in his last two seasons. He had a 12.1 SO/9 ratio last season. He can be a solid set-up man for Rivera. If you put him in the bullpen, then Hughes can focus more on starting. He is a type A that was offered arbitration. That means the only way the Yankees can get him is if he turns it down, in which case they would also lose a first round draft pick. He walks a lot of people, with a 3.2 BB/9 ratio last season and a 5.8 ratio the year before. I want Chamberlain to be the set-up man. Chat. Soriano was a pretty dominant pitcher with the Braves. You just need to hope that the Yankees can work out some of that walks problem. Other than that, he is pretty dominant. As for the draft pick — which to me is the only problem — the Yankees aren’t going to get much anyway this year, having the last pick. The bottom line is that the Yankees bullpen needs improvements, and Soriano provides that. If he works out, you can also put Hughes where he belongs: As a starter. According to a report in the NY Post, Yankees Shelly Duncan, 30, was dropped from the 40-man roster Wednesday and refused an assignment to the Minors. Duncan is now a free agent. Duncan was a fan favorite when he burst onto the scene in July 2007. He was picked up in the second round of the 2001 draft. Duncan was given a spot on the roster at the beginning of the 2008 regular season, but was sent down to the Minors. This past season, Duncan led Triple-A with 30 homers and 99 RBI’s, earning him International League MVP. In 68 Major League games, Duncan batted .219 (32 for 146), hit eight homers and drove in 24.